Covenant Relationships: Is Social Media Causing Your Marriage Problems? With the popularity of social media on the rise, research is beginning to show a direct correlation between the high volume of usage and the rise in marital problems. Many people spend too much time on social outlets and not enough time working on areas of their marriage that may be suffering from neglect and inattention. As you take advantage of the speed of communication and the networking available at the click of the mouse, remain vigilant to the areas of your marriage that might fall victim. Facebook, for example, has become the most popular website to use to reconnect with old friends and family around the world. This activity has become ingrained into daily routines and some spouses are experiencing turmoil as they deal with the renewing of old relationships by their spouses. The convenience of finding old flames and friends and the amount of time spent on these social websites can cause problems to arise in a marriage. Divorce attorneys use the posts on Facebook to fine evidence of infidelity and conversations about problems occurring in a marriage. 66% of these attorneys admitted that they do peruse Facebook for information to help their clients with divorce cases and 81% have seen a rapid rise in the references to Facebook posts being used as evidence in cases in the last five years. Marriage takes dedication and hard work by both parties. You both must focus on fulfilling the commitment that you made to honor and cherish each other at all times, not just when it is convenient for you or the internet is down. If you are experiencing some problems in your marriage or you and your spouse constantly have “discussions” about your activity on the social media outlets, this might be a good time for evaluation and reflection about how social media might be causing problems in your marriage. Using social media makes illicit behavior easier and more convenient to the wandering spouse. Instead of going to clubs and other areas to meet people willing to engage in an affair, today’s cheating spouses are using the internet. It offers anonymity and a vast pool of potential partners searching for illicit affairs. There is less risk of being suspected and caught in this destructive behavior. Marital problems that are based in wayward online behavior usually begin quite innocently. Connecting with an old high school friend may begin by exchanging up- dated information but can quickly turn into emotional sharing and communicating that should be reserved for a spouse. The sharing of personal thoughts and dreams can deepen the sense of intimacy and can lead down the road to a more intense, physical relationship between the reunited friends. The spouse doesn’t intentionally begin the contact for the wrong reasons, but if conversations take place with the old friend more often than the spouse, then problems can arise very quickly. Even though the beginning of this reconnection is innocent, after feelings begin to develop, the continuation of the “friendship” should be stopped. When one spouse tries to get needs met outside of the marriage vows, problems are just around the corner. This spouse is making a deliberate decision to share his emotional love with someone other than his partner; this will not meet his needs nor will it make his marriage stronger. This is called an emotional affair which can do as much damage as a physical affair. If a couple is working as a team, the communications and intimacy aspects of their marriage are strong and no outside support is needed. The couple respects the needs and feelings of each other and encourages individual growth and development. If these two important parts of the marriage are weak, each individual may be selfish and try to get what they desire from each other instead of being supportive. A good question to ask as you evaluate your relationship as it relates to social media is “am I talking to someone outside our marriage more than I am talking to my spouse?” If you are confused or don’t know the answer to this question, then ask your spouse for his input. He will be appreciative of the fact that you asked him and will help you find an honest answer. Be prepared to make some changes if the answer to the question is yes. You should never discuss important personal issues with anyone other than your spouse, especially if it directly affects them. Discussing this concern before discontent sets in, can make your marriage stronger and can start a sensitivity that promotes new growth in your relationship. Find a quiet, private place so that you can talk about social media and how it affects your marriage without being embarrassed. It is very important to be proactive in dealing with problems that one spouse may perceive in the marriage. The emotional support needed in a healthy relationship can be provided with open and honest discussions thus eliminating the need for assistance from outside the marriage. To build strong trust in a relationship, it is important to disclose all online conversations, friends, and online activity. Share passwords and access keys to the social media accounts like Facebook, Twitter, and Google. You can still respect each other’s privacy while providing access to your social sites. If you have nothing to hide, then you won’t mind your spouse being able to see your accounts. Trust and honesty are the cornerstones of a good marriage so work hard to keep these viable in your relationship. If one partner does not want to share this access, there may be trust issues that stir an underlying current of trouble in the marriage. Exploring this tide of mistrust early can prevent a tragic ending. If you feel after beginning the evaluation process of your social media activity, that it is adversely affecting your marriage, you can take some steps to prevent any further damage. Begin by unfriending those who are a temptation to you. Examples of dangerous liaisons are old flames and other individuals searching for “something” to fill a need they are experiencing. Next, have your computer screen so that it can be seen by your spouse whenever you are online. Don’t minimize your window if your spouse walks by. If you are ordering a surprise for a birthday or holiday, then that should not be a problem. All of your activity should be available for your spouse to see. Avoid chatting online late at night or when your spouse is away from home. This can be common sense for your safety as well. You don’t want the entire web to know that you are home alone. It’s also a smart idea to set time limitations for your internet use. You will want to have time in the evenings after a long day to discuss events with your spouse. Devoting too much time to any type of activity can harm your relationship with your spouse. This includes spending a great amount of time on social media outlets. It causes distress with your spouse and has become one of the largest problems that married couples face today. As couples, we strive to find enough quality time to spend with our spouse and yet, we have very little trouble finding enough time to browse the internet for long periods of time. Participating in online activities can become addictive if you aren’t careful; commit to spend more time with your spouse. On Facebook, users spend over 500 billion minutes a month in varying activities. Whether it’s a game-oriented activity, browsing profiles, or chatting with friends, it’s valuable time spent away from a spouse. Many people lose track of time while they are engaged in internet activities which can build up tensions between spouses. Face-to-face personal time is limited and friendly discussions are lost in cyberspace conversations that take place sometimes with strangers. The key to a successful marriage is constant and caring communications and when this suffers, the relationship suffers. Most Facebook users have an average of 130 friends who range from old boyfriends/girlfriends, past love interests, nosy in-laws, toxic co-workers, and family friends who have nothing better to do than cause problems among “friends.” When these people are online chatting, they are taking away real time interactions between spouses. The marriage of the couple is affected in a negative way many times and problems arise that would never have arisen had the internet user turned off the computer a little earlier. Information on these social media sites is passed from person to person at a rapid rate of speed and many times with inaccuracy. Spouses find themselves regretting something that they have said or second guessing the intent of a post. If a post is made regarding one’s spouse that includes complaints or negative comments, the marriage will be adversely affected and tensions will be created. Each day, users normally contribute 70 pieces of information on Facebook each month. With this level of activity, miscommunication occurs, comments are misread, and inappropriate comments are posted. Sometimes too much information is provided about a personal situation; the result of this action is an angry, hurt and embarrassed spouse. Many social media users forget the fact that the entire world can see and respond to comments posted on accounts. For couples over the age of thirty, this can be the first online activity in which they have participated. Trying to understand the online community and navigate through the myriad of choices and selections to make can be confusing and uncertain. Remember that online is not the place for jokes or “just kidding” comments. Intonations and meanings cannot be completely portrayed online thus many feelings of ill well can be fostered. Couples should discuss how to establish boundaries for common sense for postings online. This will facilitate a better plan for using social media websites for positive and educational reasons. You don’t want to have a constant argument about the use of social media in your home. Select your friends carefully and agree to be conservative with the types of posts you make that represent you as a person and the two of you as a couple. Make this a win-win situation for you and your spouse. A social media website is not the place to air your dirty, personal laundry that can cause embarrassment to your marriage or your spouse. Even if you think you are kidding, the intent will be perceived as rude and cruel. The entire web should not see any negativity in your marriage; always make posts that are positive and uplifting.Accentuating the positive aspects of a marriage will make it stronger and cause it to grow and deepen. Think of your marriage as a team effort with you and your spouse as team members. Together, the two of you can achieve your goals and dreams if you encourage each other and truly care about the progress you are making as a winning team. Be careful what you share about your life as a couple online with others. There are anniversaries, birthdays, celebratory occasions, and other events that we want to share online. Your friends and family will want to share your happiness with youand sharing those accomplishments up to a point is acceptable. Reserve the intimate details of your marriage for the privacy of your home environment. Some things are better shared only between the two of you not the entire world. Keep the special things “special” and don’t dilute the importance of the occasion by telling every breathing person the details. Each spouse should carefully check the friends list of the other. Locate people with whom you feel uncomfortable and unfriend them. If online friends are making vulgar or inappropriate comments, consider hiding their comments or deleting them all together. Discuss with your spouse any conversations or attempts at chat that people make that cause you stress or concern. In today’s world as we travel online and meet people that we don’t really know much about, our personal safety should be at the top of our list when accepting friends. Your spouse may become upset if you reveal personal information like addresses, telephone numbers, or daily activity that lets people know that you are home alone or you are away from home. Never tell things that a criminal element might be watching for ill will or gain. Decide with your spouse early on the type and amount of personal information that should and should not be shared online. Any contact on a social media outlet that strains or causes stress in your relationship with your spouse is not worth keeping. 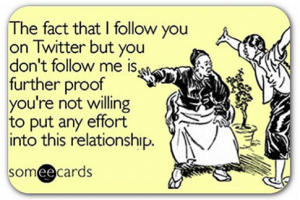 It is a good practice to demonstrate on your social media accounts that you are very happily married. Include pictures of you and your spouse in your online photo albums. Mention them frequently and introduce them to your friends just as you would in a real life situation. Establish in a very convincing way that you are married and are not seeking any liaisons of any sort. Let your marriage come through in all of your posts and comments. If the choice comes down to participating in social media or working on your marriage, you should always choose the latter. Don’t ever take your marriage for granted or put it second to your social media accounts. Neglect of your partner can cause boredom, loneliness, and a craving for attention and conversation. Spend quality time each day with your spouse one-on-one and put the computer in its proper place. Your online friends should come second to your spouse who is the love of your life. Don’t let interruptions and trivial discussions take time from your marriage. As you reflect on your social media activities, think about how much time you spend playing games on these websites. Are you leaving real-time activities and events waiting while you feed virtual animals or harvest fabricated crops? This can be devastating to a spouse who has had a difficult day and yearns for love and support. Make sure your priorities are in line with your marriage commitment and vows. Do not flirt or post inappropriate pictures on these social media sites. You must watch what you post and anticipate how a reader might take your comment. You do not want others to think you are flirting or making suggestive remarks; your spouse will be very disappointed and angry with this type of behavior. Be aware that these types of posts will cause problems in any marriage. As divorce statistics begin to show that activity with social media is affecting marriages, a common sense approach should be taken when evaluating its impact on your marriage. Being unfaithful has been present in society long before social media exploded into our culture. Spouses who are prone to cheating are simply using social media outlets to connect in a more subversive method to conduct their affairs and wandering ways. They are keenly aware of the slippery slope they are treading upon but proceed with their behavior because of the protection these social media outlets afford them. They can remain anonymous and conduct conversations without fear of being caught. The bottom line is that a spouse makes a bad decision and social media outlets are just the vehicle used to promote that lapse in judgment. The underlying cause of a problem marriage is usually a failure of communication, attention to the caring of the emotional needs of a spouse, or using time to develop individual interests instead of working on the marriage. Friendships online can quickly move from appropriate and acceptable to inappropriate and unacceptable with little effort or time. A spouse who is unfaithful in an emotional relationship makes a deliberate decision to go outside the marriage vows to satisfy a need that they had. Instead of working with a spouse to address those needs and wants, the guilty spouse demonstrates a flaw in character as they place themselves in the dangerous position that may ruin a strong marriage. A good, strong marriage is based on communication, hard work, and effort. It’s a daily job that requires determination, devotion, and dedication to the love of your life. Investing time and compassion is a prerequisite to the growth and development of a marriage. A delicate balance between individual and couple activities is needed to ensure a couple of a successful marriage. If this balance is disrupted by an unusual amount of time being devoted to social media, then problems will arise. Hiding secrets in your social media accounts will erode the trust and honesty you have worked so hard to develop. Messages that flirt with or encourage others to make inappropriate comments will cause guilt and resentment. This, in turn, will affect the way that you react and respond to your spouse. You will overcompensate for your infidelities and soon, suspicions will arise concerning your online activity. Anything that you hide will create problems for the two of you. Practicing transparency with your social media activity removes all doubts and establishes a pattern of trust and accountability. A good rule of thumb in gauging your internet activity and how it is affecting your marriage is to pay attention to what your heart is telling you. Your heart is a good guide to tell you when you are sailing down the slippery slope toward infidelity and endangering your marriage. If you are feeling an excitement that you cannot share with your spouse, then your action should be stopped before it is done. If you can’t share something with your spouse, then that should be an indication that something is not worth doing. When you post on social media outlets, your life becomes an open book for everyone to see. Unfortunate circumstances arise when people are looking for greener grass on the other side of the fence. What many do not realize is that the grass also needs mowing on that side of the fence as well. Studies show that one out of five cases of divorce includes a mention of some form of social media. Even though the rate of divorce has declined in recent years, social media has become an outlet that can cause marital problems. There’s not a doubt among researchers that social media can be a threat to the strongest marriage. Instead of offering virtual attention and compassion, you need to demonstrate that in real time and with caring toward your spouse. Technology when used appropriately and in a balanced way, works extremely well for couples. The key to successfully using the social media outlets as they relate to your marriage requires setting boundaries, being transparent and honest, avoiding the pitfalls of inappropriate friendships and conversations and putting down the computer or cell phone when your marriage needs tender loving care and attention. Remember to engage your spouse in interesting conversations on a daily basis and to share access to your online accounts with each other. Refrain from making comments that have content that is questionable or whose intent is not clear. Don’t let social media activity influence the growth or deepening of your relationship. Marriage should be for a lifetime; social media should be experienced in small doses. I’m so glad someone has posted information on this. I know I’m guilty of spending too much time on Facebook and I’ve noticed that my husband has started playing games on Facebook too. The problem I think we have is that we’ve lost a lot of natural communication. We’re just focused on these social media sites, posting and reposting the same junk. I’m surprised that it’s gotten to the point that attorneys use Facebook as evidence to prove infidelities. It shows that it’s a larger problem than we think. Since reading this info I’ve made it a point to communicate with my husband and I’m glad to find that he’s equally committed in renewing our conversations. We’re trying not to leave the laptops on too late in the house and we make it a point to not bring them into the bedroom. I know these are just small little tricks and solutions, but they've worked for us so far. We are talking more and rekindling our relationship.